I have become a little more conscious about eating fried food these days. They are not completely cut off but avoided whenever possible. This posed a challenge to me when I had plans for making vegetable fried rice this week. Knowing that hubby dear prefers eating his rice with a side dish or gravy (never understood this as I always prefer it on its own). with my new found love for the oven which otherwise until last year was used as an extra shelf in the kitchen, I decided to put it to good use. The first batch was a wreck so I gave it another shot this time correcting the recipe to meet the exact requirements. 1) In a pan heat some oil , add the carrots, cabbage, ginger garlic paste and sauté on high flame for about 2-3 minutes until the raw smell vanishes. 3) Form small balls of the dough. Pour some oil and roll them to get even coat. 4) Place on a lined baking sheet and pop in a preheated oven at 180c for about 10-12 min. Watch it and flip around to get even brown color on all sides. 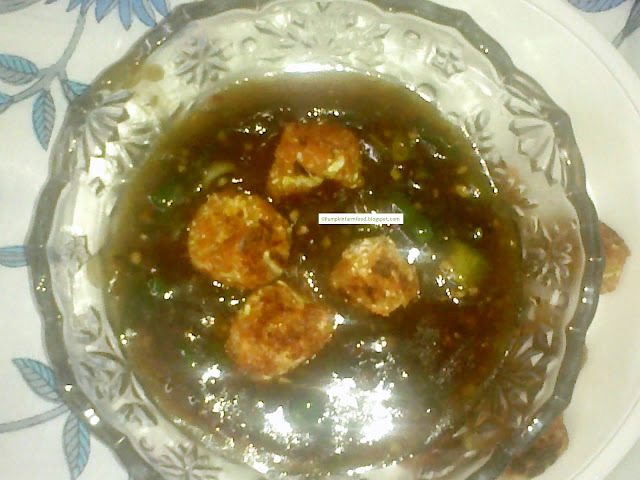 5) While the Manchurian balls are getting ready, heat a sauce pan along with some oil. 6) Add the onions, capsicum and sauté on a medium-high flame. 7) Add about 3 cups of water and let it boil. Reduce flame and let it simmer. 8) Add the corn slurry in a steady stream while stirring constantly. 9) Add the soya sauce, vinegar. Taste and check for salt and add more accordingly. 10) Add the spring onions greens on top and let it simmer. 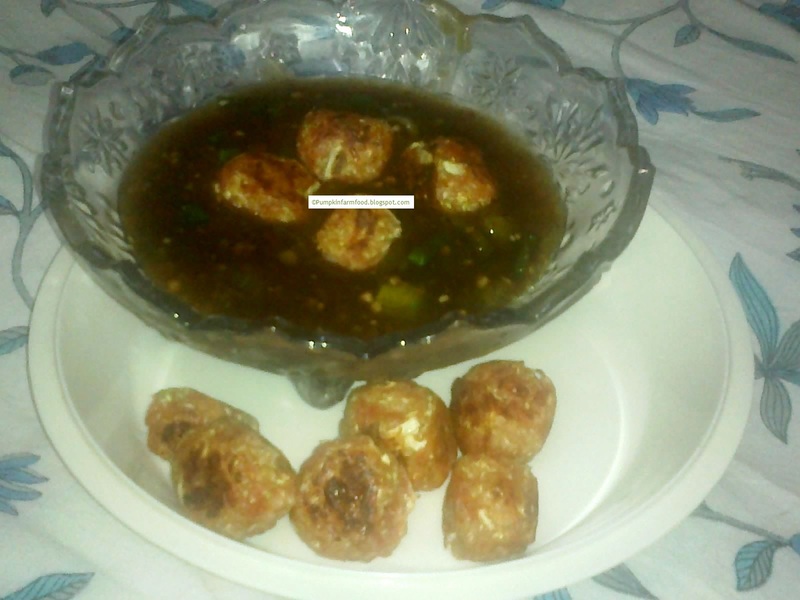 11) Check for the Manchurians, if they are done then pop them in the gravy. Save a few for last minute addition as it gives a combination of crunchy and soggy balls. Serve hot with noodles or rice. A healthy version dear, love these manchurian balls..
looks yummy and healthy too..would love to try this..
YUm yum,seriously feel like having that wonderful bowl,delicious! Baking it is truly good! The dish is tempting!